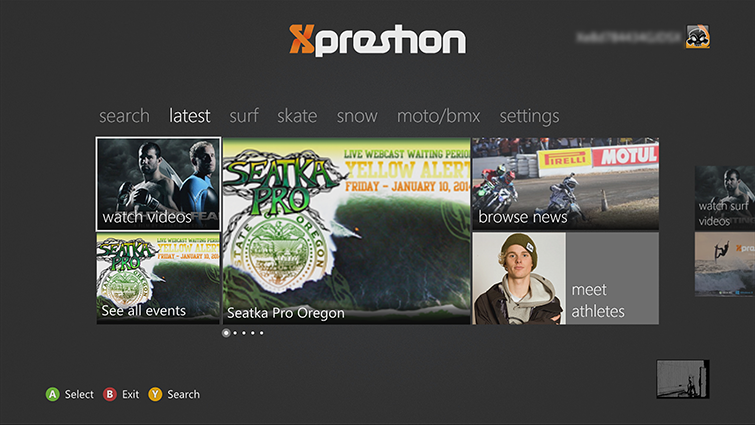 Learn how to install and use the Xpreshon app on your Xbox 360 console. At least 125 megabytes (MB) of available space. Browse or search for Xpreshon. Select Xpreshon to download and install the app. After downloading, the app automatically starts, and you can browse through and view details about the available content. To start the Xpreshon app later, go to apps, My Apps, and then Xpreshon. When you try to play premium content and you either haven’t subscribed yet or aren’t signed in, you’ll see the Watch premium content screen. 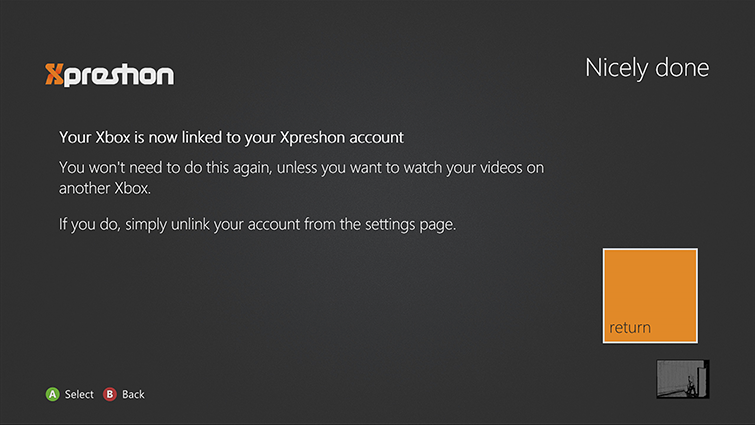 On this screen, you’ll be prompted to link your gamertag to your Xpreshon subscription or go to xpreshon.com/watch to subscribe. To learn more, select Read more about subscribing. This walkthrough summarises the sign-up process on the Xpreshon website. 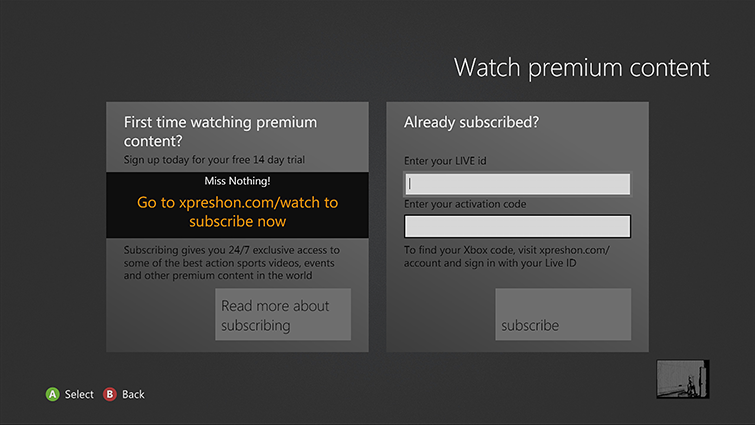 When you subscribe, you’ll be given a code that you use to link your Xpreshon account to your gamertag. Make a note of this code. 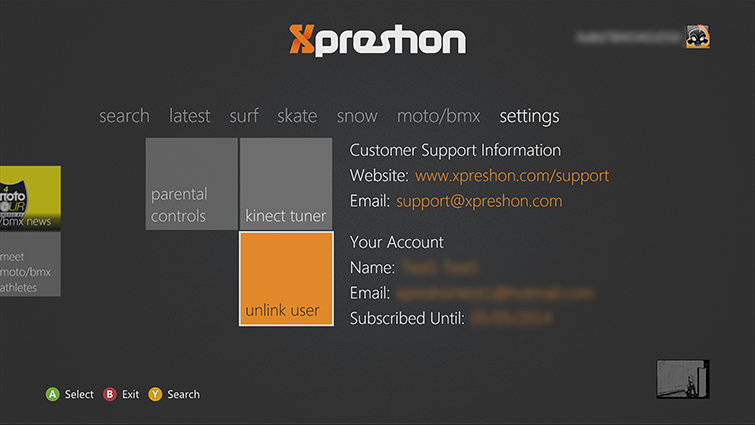 If you’re a current Xpreshon subscriber, you’ll need to go to xpreshon.com/account and sign in with your Microsoft account to get your activation code. Go back to the Watch premium content screen on Xbox 360 to enter your Microsoft account and the new code. Then, select Subscribe to complete the activation process. A “Nicely done” screen will be displayed once your accounts are linked. Select return to continue using Xpreshon. Note You can also start the subscription process by going to the settings hub in the app and selecting link user. To open the Xpreshon app, go to tv & movies, My Video Apps, and then Xpreshon. On the latest hub, you can find the newest featured content. Just select any content that you’re interested in to start playing it. You can also browse by topic. 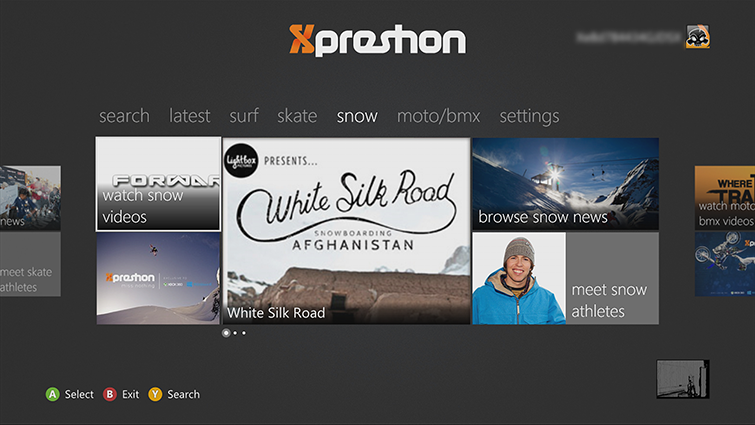 Navigate to the right to select surf, skate, snow or moto/bmx to find content related to one of these topics. 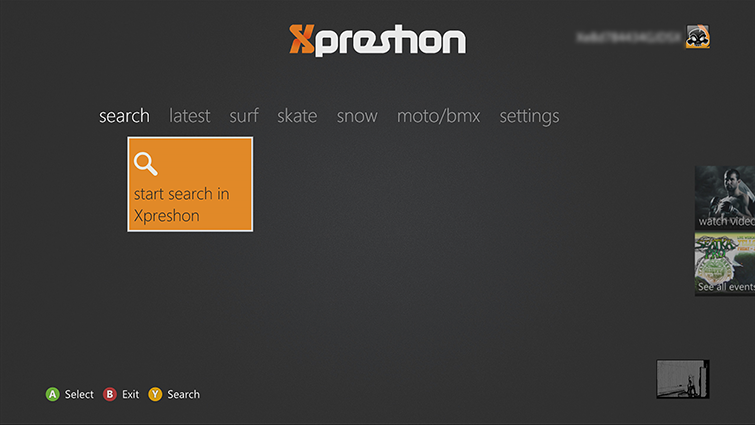 To search for content, select Search, and then select start search in Xpreshon, or say “Xbox, Start search in Xpreshon.” Then, search for the content that interests you. From the Settings hub in the app, select unlink user. Note There is no confirmation screen or question. After you select unlink user, the tile will simply change to link user. Select link user if you later want to re-associate your account or if you haven’t yet associated it. To manage your Xpreshon account, go to xpreshon.com/account, and then click Manage Account. Follow the steps to sign in and make changes to your account as necessary. If you use Family Settings to control which films and TV shows can be watched through Xbox Live on your console, the Xpreshon app will follow those settings. For example, if you prohibit R-rated films or TV-MA-rated TV shows from being watched on your console, those programmes will be marked in the Xpreshon app with a “restricted” icon. To play a restricted item, an adult must enter the Family Settings pass code. Would you like to contact Support regarding the "Set up and use the Xpreshon app on Xbox 360" issue you were reading about or a different issue?